Praying Mantis Max is on the hot water jug. J.K.Leahy Pic. 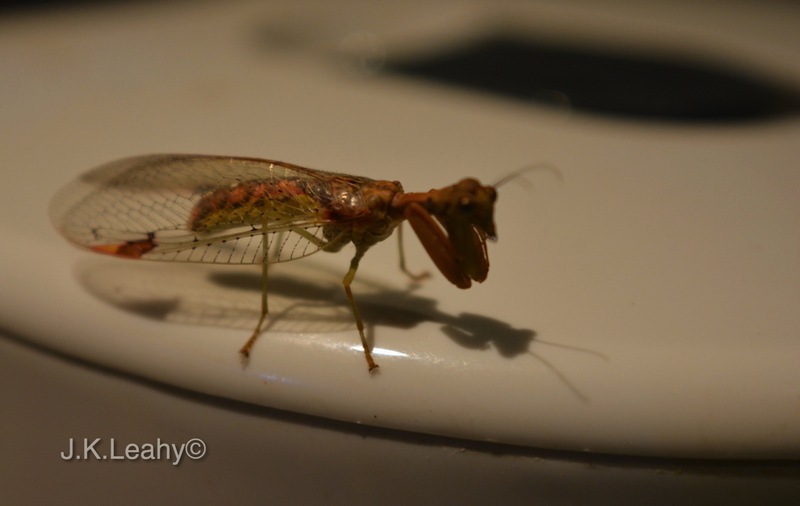 I haven’t photographed with my macro lens in a long while, but tonight I was surprised by this macro praying mantis when I tried to make myself a cup of tea. 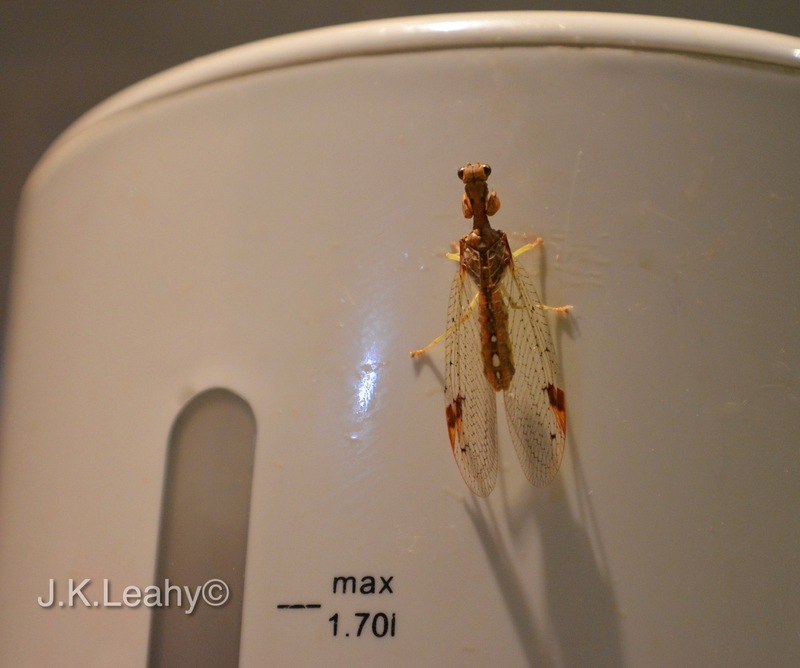 It sat there on my water jug which had not been boiled yet. A closer look; Max as we shall name him or her, is adorned like a gorgeous African queen with matching coloured skirt to her large stud earrings. This little brown insect is not more than ten centimetres long without its wings. It was very still when I took the photos, but because a hungry gecko was nearby, I lifted it away from the jug and placed him high in the ceiling. That’s all I could do. Praying mantis were part of my early life when I spent hours in the bush and gardens with my grandma. We have a song which we sing when we see one, and it actually makes them dance. I didn’t try the song tonight or make Max dance, but I tried to save Max, knowing Max had too many predators around. The praying mantis is named for its prominent front legs, which are bent and held together at an angle that suggests the position of prayer. By any name, these fascinating insects are formidable predators. 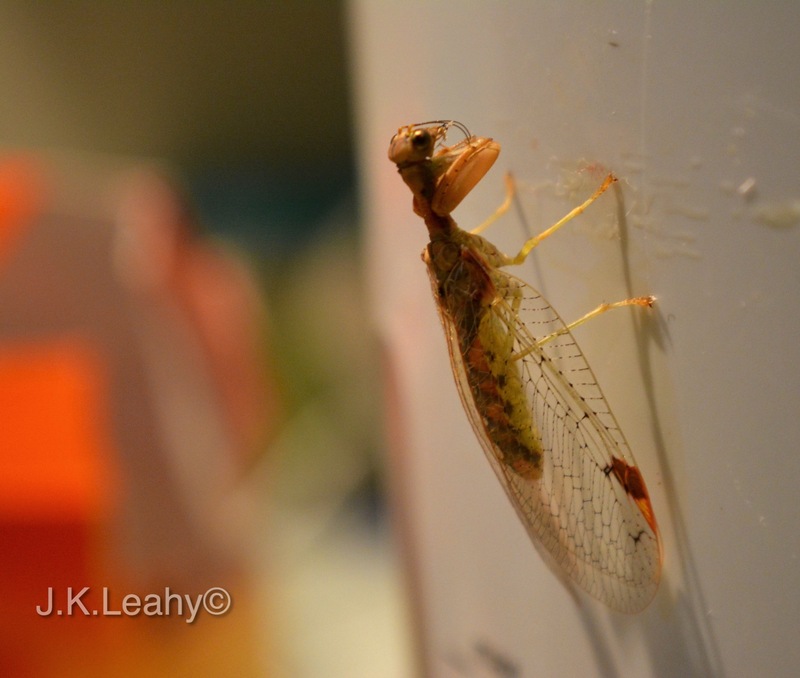 They have triangular heads poised on a long “neck,” or elongated thorax. It does look beautiful from an artistic point of view. But, being raised in a city, I’m sure it would have scared the living daylights out of me. Hahaha – sorry, a lot of my blogger friends are afraid of spiders I post. You – praying mantis? – Okay let me tell you, he is only a little guy. Tiny. 🙂 He just wants to get away when you get close, so if you ever see one don’t be afraid. 🙂 Thank you!!! It’s just human instinct…that acts first before I can even rationalise. Looking forward to more of your posts! Great pictures, Joycelin. I’ve never seen a Praying Mantis – I don’t think it’s an insect we really get in this part of the world!